The real estate market in Lebanon is booming. Tall and skinny homes are being built within walking distance of the downtown square. 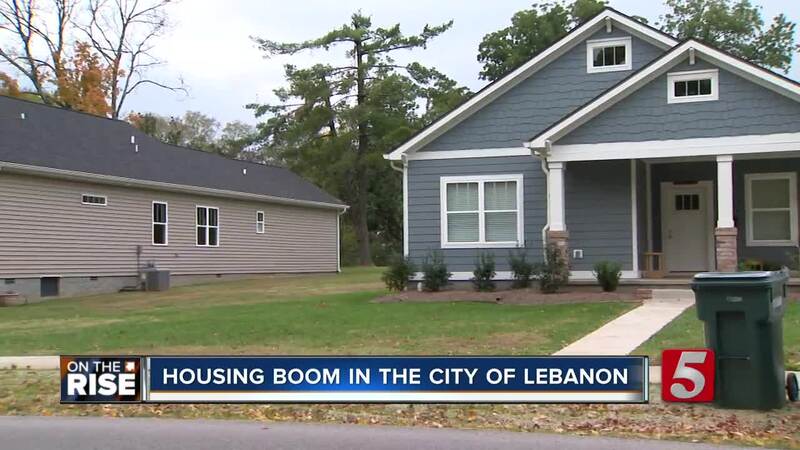 After some zoning changes, developers are now investing in Lebanon. The Planning Director said in two or three years they've seen a lot of families move to town. Paul Corder said, "We've had over 1,200 building permits for single family homes and 1,500 I think, a little bit more, than that for multi-family homes." City planners believe the growth is piggy backing off of Nashville. Many families use the Music City Star to commute to Nashville but choose to live in Lebanon and send their kids to Wilson County Schools. The economic development director said she hasn't seen development on some historic streets in a long time. Sarah Haston said, "As the community has evolved and we go through so many changes, and we have this newer generation moving in, we want to make sure there's a real succession plan and all the culture of the city that we want to stay stays as we continue to grow and evolve." StoneBridge: Off Leeville Pike east of Highway 109, 809 total homes planned. Just under 600 homes are either complete, under construction, or planned for construction next year. Wilson Farms: On the south side of I-40, up to 728 multi-family units in addition to retail, commercial, office and hotel use are part of the plan. Holland Ridge: Approved for up to 345 single-family homes and townhomes off Leeville Pike. Waverly: The working name that may change for a development with approximately 700 homes near Hickory Ridge Road. Rowland Farms: Off Leeville Pike and across from Tuckers Gap Road. It's approved to build approximately 55 homes. Woodall Ridge: A townhome development with 219 units. They are still going through the final site plan approval process. Woodbridge Glen: Formerly Cedar Ridge, received preliminary plat approval for a 517-lot subdivision. Woodbridge Glen Townhomes: This townhome section consists of 49 units.